Scotland's Six Nations clash with Ireland at Murrayfield this weekend will be the 123rd meeting of the sides since their first encounter in February 1877. Ireland's sequence of matches this year follows the pattern of 1948 when they won against France (13-6), England (11-10), Scotland (6-0) and Wales (6-3) to collect their only previous Grand Slam. Scotland lead the series by 62 wins to 54. The last of the five draws was in 1994. The first of the two matches staged in 1885 was abandoned with Scotland leading, but the sides agreed to a replay a fortnight later, provided the outcome of the abandoned match should not stand as a win for Scotland. Both games carry Test status. There have been 41 matches at Murrayfield since 1926. Ireland lead by 21 wins to 19 and the only draw was in 1979. Ireland's 44-22 win at Lansdowne Road in 2000 and Scotland's 38-10 Murrayfield win in 1997 are the highest scores recorded by the teams in this series. The best winning margin (30 points) in the matches was established in Ireland's 36-6 success at Murrayfield in 2003. Ireland's David Humphreys set the record for the highest individual score in a match contributing 26 points at Murrayfield in 2003. Chris Paterson holds the corresponding Scottish record with 18 at Murrayfield in 2007. William Stewart, a Tasmanian-born wing who played for Scotland, scored a record four tries in the 1913 fixture. Three players have scored try hat-tricks for Ireland: Eugene Davy (1930), Séamus Byrne (1953) and Brian O'Driscoll in 2002. 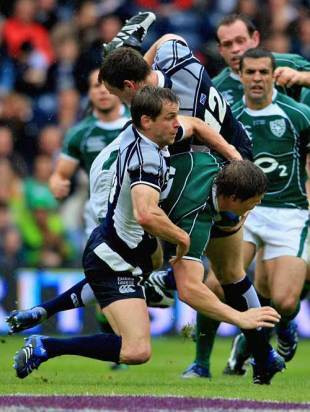 Ronan O'Gara is the leading overall scorer in the matches. He has scored 92 points for Ireland in ten matches since 2000. Gavin Hastings set the corresponding record for Scotland with 75 in his ten appearances between 1986 and 1995. Chris Paterson is ten points behind him. Scotland's Roy Laidlaw scored most tries in the matches: six in nine games between 1980 and 1988. Alan Duggan (1967 to 1971) and Brendan Mullin (1985 to 1995) each scored five for Ireland in this fixture. Mike Gibson holds the record for most appearances in the series, playing 14 times between 1964 and 1979. He was capped eight times as a centre, five times as a fly-half and once as a replacement wing. Sandy Carmichael, Scott Hastings and Bill MacLagan appeared eleven times for Scotland.